The Pathways workshop on May 27 for Pine Belt Quilters went very well. I continued with the Power Point Presentation to refresh some of the information from the program two weeks earlier and to see details of how we can draw our own designs, add registration marks, match registration marks on a light box, and stitch the pieces together. Having the PowerPoint with pictures was most helpful, allowing a quick look back to compare color choices and construction methods. 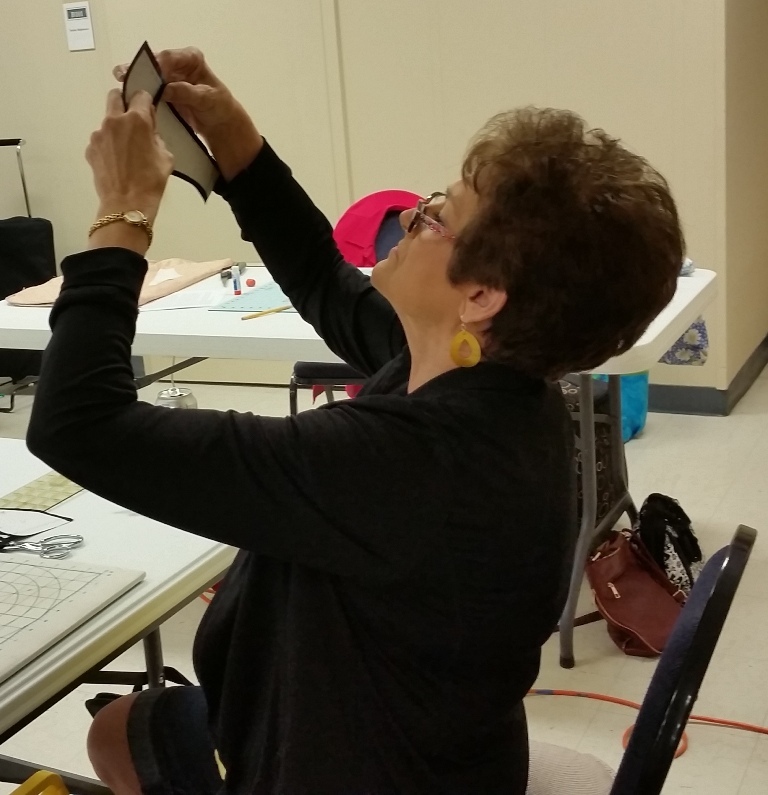 I am so proud of the guild's recently purchased projector, and we will all benefit from better programs by using it and the new camera. To get comfortable with the Applipiecing technique developed by Caryl Bryer Fallert-Gentry, I had the students construct a small design about 8" x 10" before starting on their larger project. 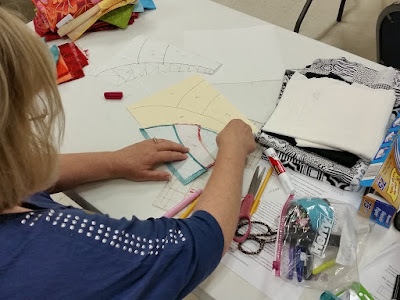 They cut out freezer paper patterns and ironed these pieces to fabric and cut out, then used glue sticks to turn the seam allowances on the "over" edges. These "overs" were then positioned on the "unders" by matching registration marks. A light box works well for positioning the pieces, but a quick holding up to the light helps, too. After working on the small practice piece, I had the students select their larger design from the four patterns I had prepared. 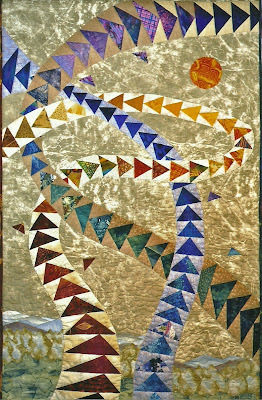 They began deciding on the pathways in their larger piece, some adding Flying Geese, Piano Keys, Spikes, and some using solid fabric paths. 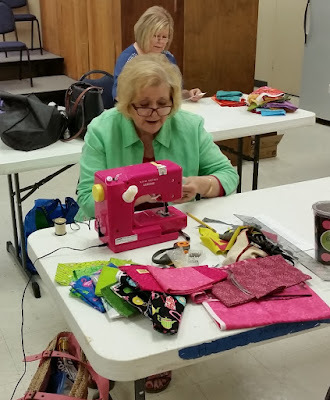 Some of the sewing machines had tension issues using the invisible thread, even after changing needles and trying other spools of thread, but Suzannah's little Janome didn't know it should have problems and performed like a real trooper. 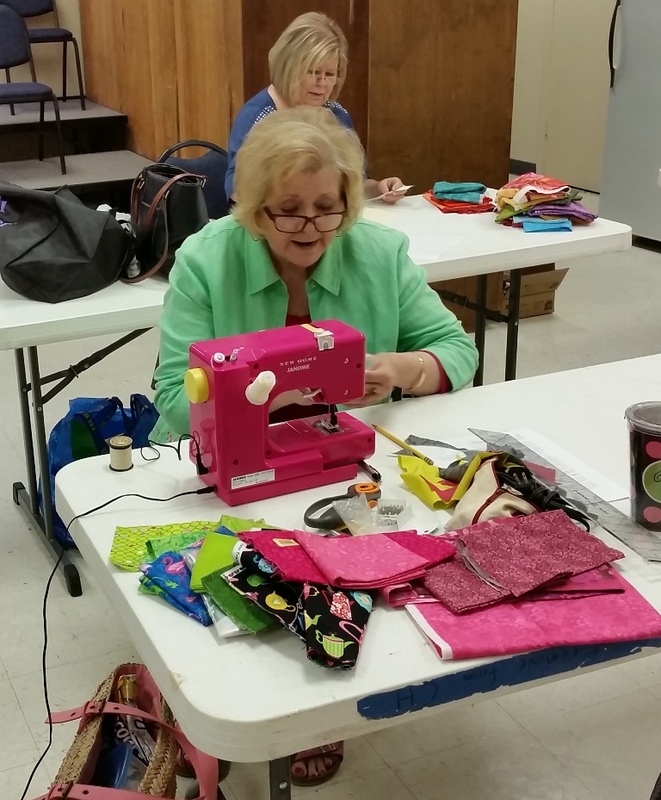 She had never used the machine before and we expected disaster and were happily surprised at her outcome. Some of the students planned to alter their designs and use the Pathways in a novel way, which is always a thrill when a teacher feels like the students are taking the class one step further by adding their own innovation. We were so busy that I didn't get pictures of the finished small pieces before an approaching thunderstorm caused us to need to move sewing machines to cars before the rain started. I'll post more pictures later. It was a fun and successful day! 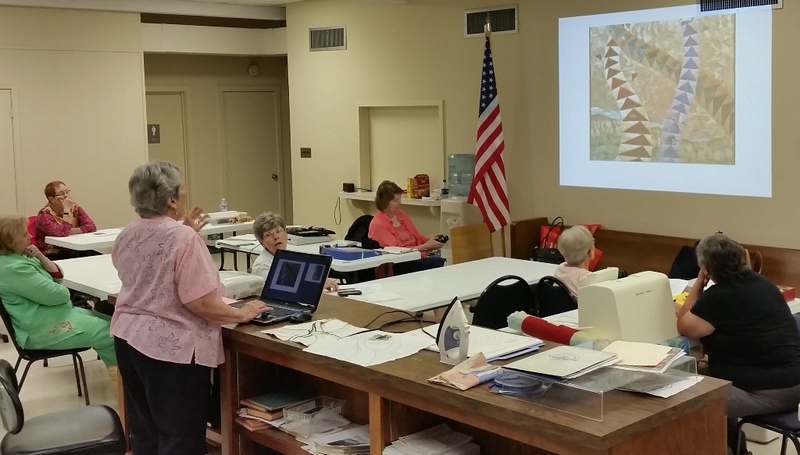 I enjoyed giving a PowerPoint presentation program on Pathway designs at our Pine Belt Quilters May 13 meeting. This is what I call several "pathways" crossing a background. I have been in love with this type of design for many years from admiring Caryl Bryer Fallert-Gentry's remarkable quilts. Of course, hers are intricately challenging pieces, but I began trying some simple designs in 2008 when my niece in Colorado asked me to make a 35" x 55" piece for her wall. She had no specific design in mind--but I knew from her professional photography skills that she loved brilliant colors. I made "Marilyn's Pathways" and she was delighted that I had captured her admiration of the mountains and Canada Geese she saw on her morning walks. Marilyn's Pathways, 2008, 35" x 55"
Later I purchased a pattern from Caryl called "Square Dance," which taught her Applipiecing® technique for joining curved pieces, and realized this technique was the answer to many of the challenges encountered in Marilyn's piece. 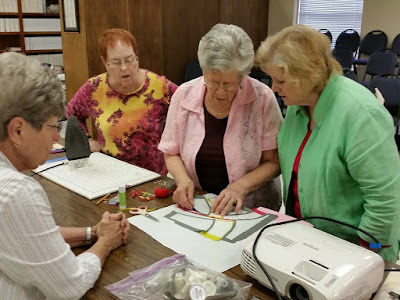 Then in 2009 I attended a four-day "Beyond the Grid" workshop at Caryl's Paducah studio where we learned to draw and construct our own designs. I will be ever grateful for Caryl's inspiration and generous sharing. 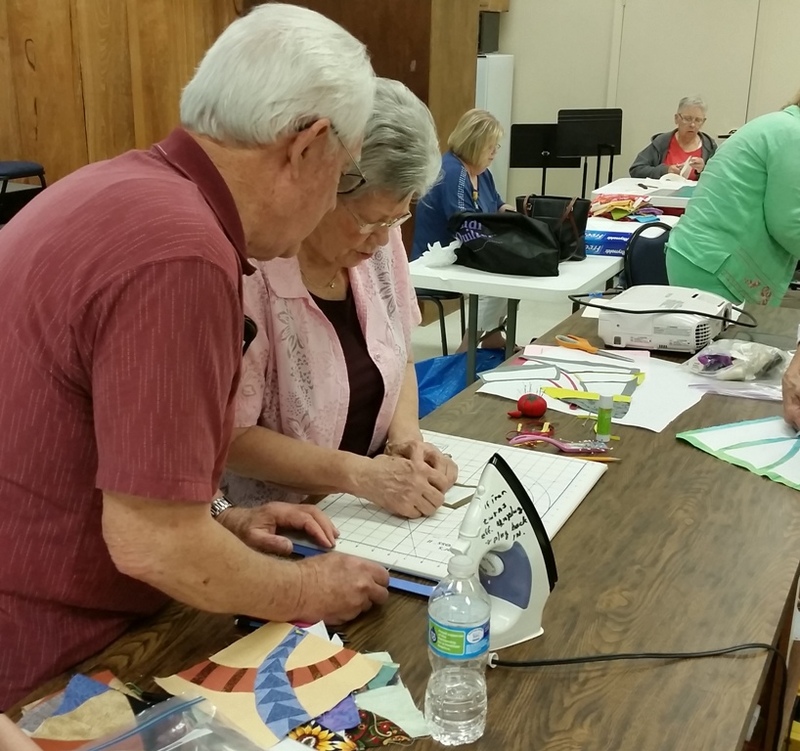 Her website contains a wealth of information and I encourage quilters to avail themselves of her patterns, articles, and instructions (www.bryerpatch.com). Learning from her was a dream come true I will always remember. The piece I started in her workshop and later continued and completed at home, Galaxy, is one of my favorites. The background is Caryl's gradated fabric, with the blue pieced pathway of hand-dyes by Mary Nell Magee and the two solid pathways my own (one-time foray!) hand-dyes. 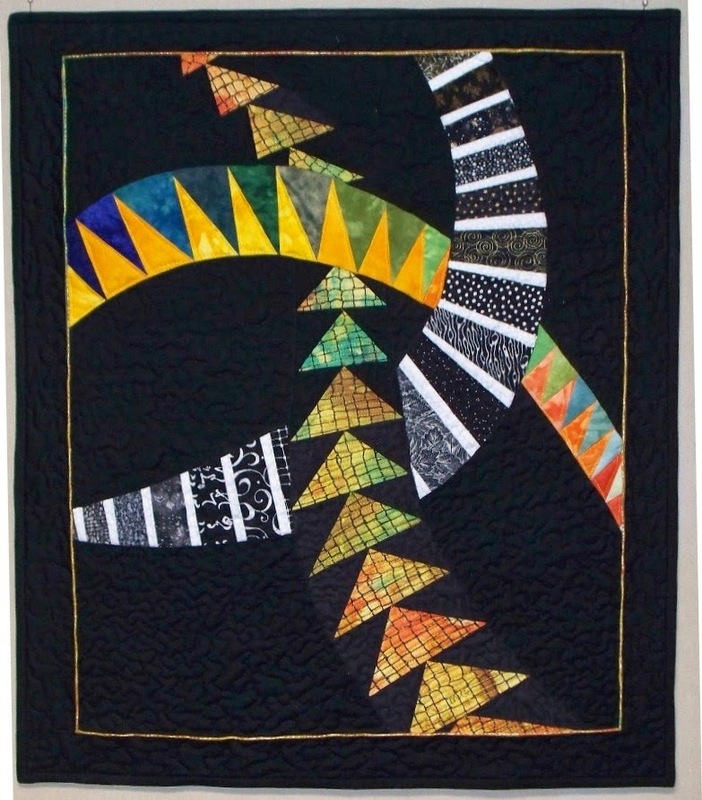 Galaxy, 2011, 37" x 24"
Since then I have made several other quilts I could not have made without her marvelous Applipiecing® technique. Sharon Shamber and perhaps others use a similar method but I have only read about these. Ribbons of Change, 2010, 25" x 29"
Ribbons of Change was made in 2010 and donated to the AIDS Services Coalition auction, and you can see Caryl's influence on my color choices of the mountain/valley pathway. She often gradates the mountain peaks and the valley peaks in the opposite direction (one from light to dark and the other from dark to light). My guild has recently purchased a camera and projector, which makes it much more possible for members to see and enjoy a program featuring items that we no longer own. I'm looking forward to teaching a Pathways workshop in two weeks and helping quilters make their own design, thanks to Caryl's Applipiecing®!I have drawn four designs that quilters may choose from. 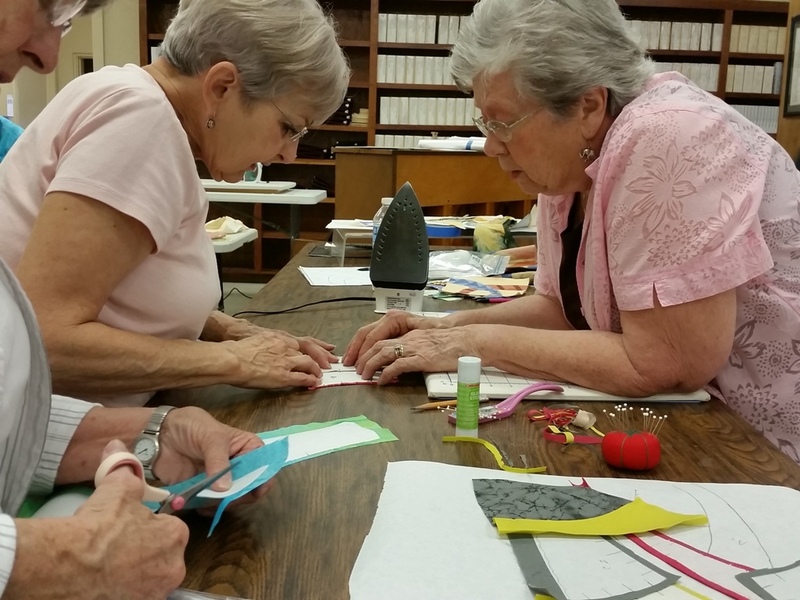 These can be oriented different directions, and everyone will decide on her own pathways and fabrics, so no two quilts will be alike. Meanwhile, my foster kittens from Southern Pines Animal Shelter are seven weeks old and running to greet me when I go into the garage. 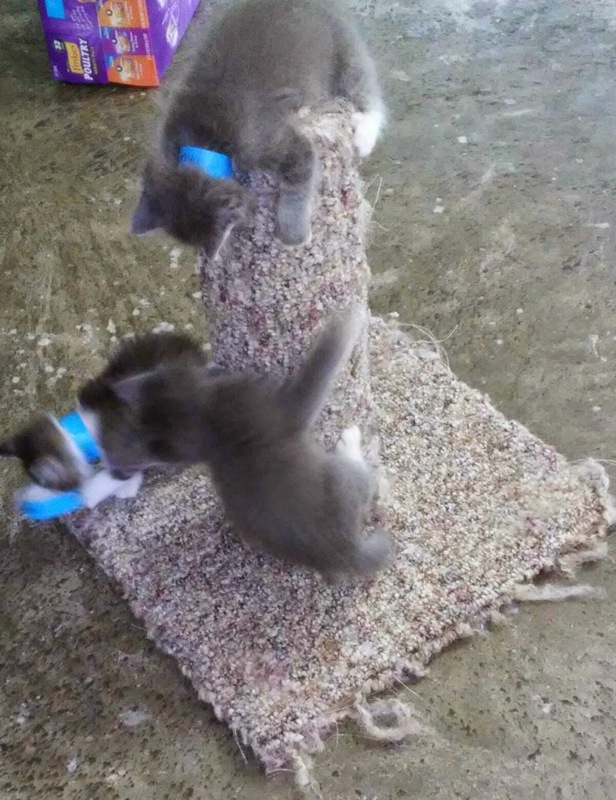 They love to be picked up and purr loudly; they are getting near their required two-pound required weight for their surgery and adoption. 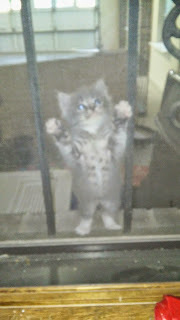 My house cats are still terrified of them and will be glad for them to find forever homes! 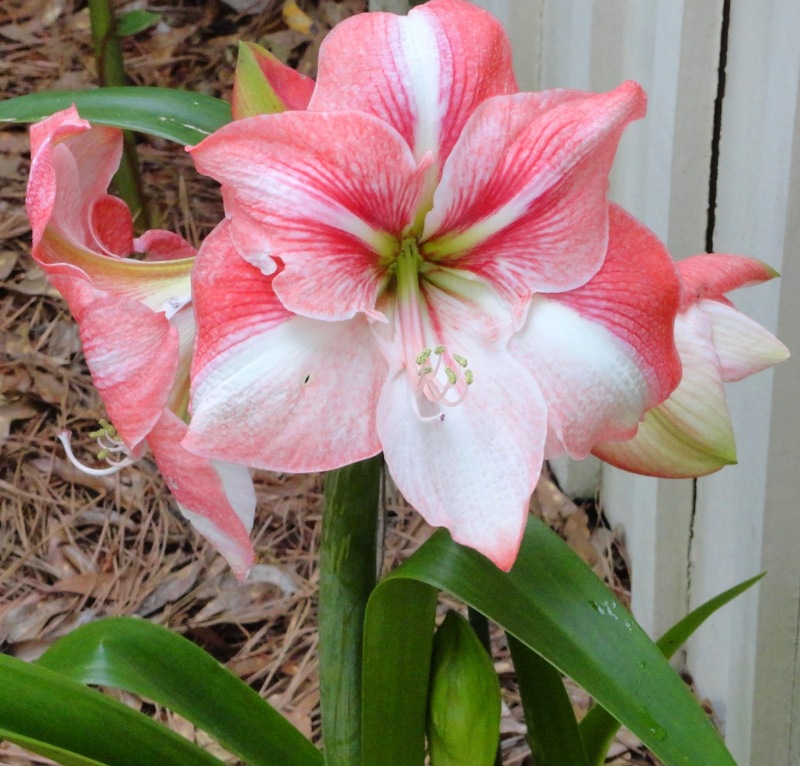 This amaryllis is about seven or eight years old and produces some of the largest blooms I have ever seen. 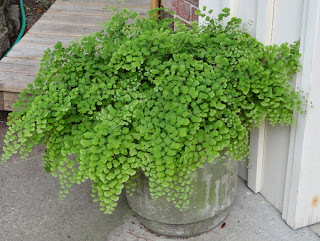 It was a gift which I later planted outdoors in a flowerbed on the east side of the house (so I could see it from the kitchen window). This year it has two stalks with nine blossoms. The second stalk can be seen low on the right. 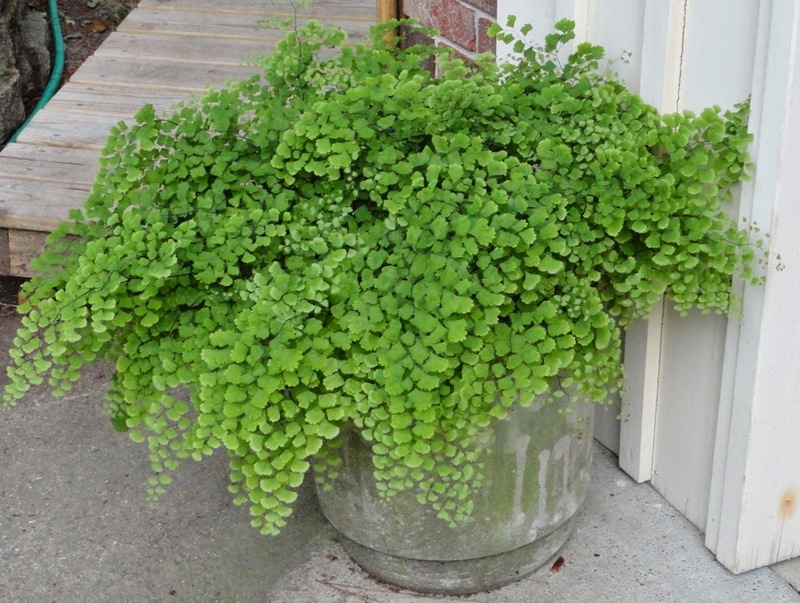 The maidenhair fern survived the winter in the garage; after trimming all the old fronds, it has put on fresh fluffy greenery. 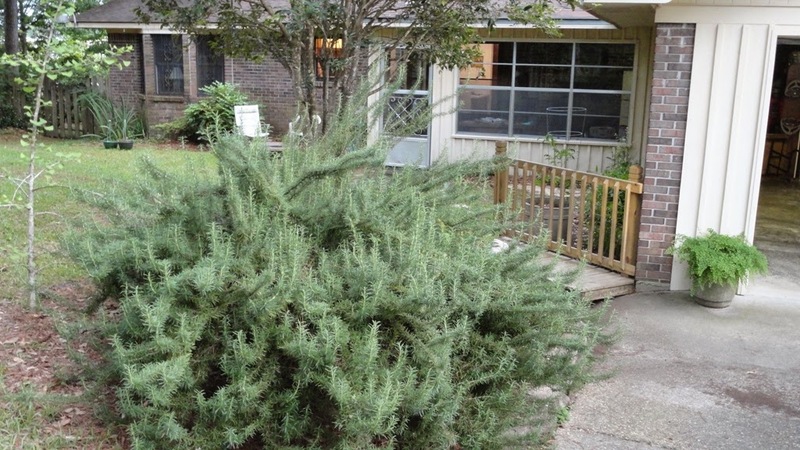 My rosemary bush was unfazed by the cold winter temperatures. My foster kittens are growing; their mama, Caboodle, has weaned them and gone back to Southern Pines Animal Shelter to get spayed and adopted. 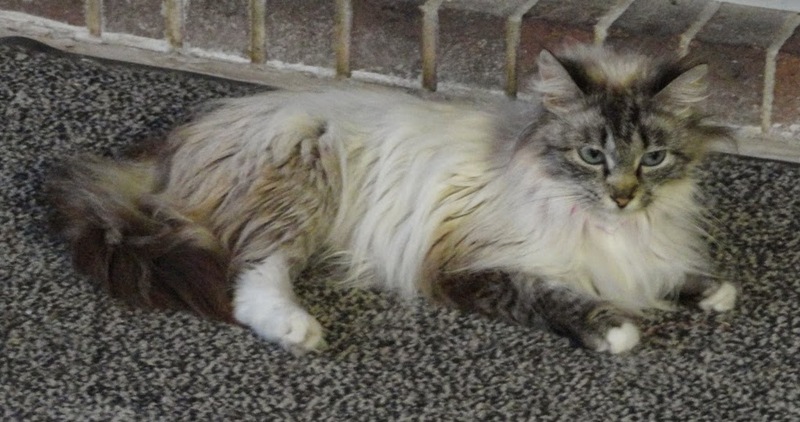 She is such a beautiful and sweet little cat that I'm sure she'll find a home quickly. The kittens are almost to their two-pound weight required for their surgery and adoptions; meanwhile, they are having a good time in my garage and a delight to watch. 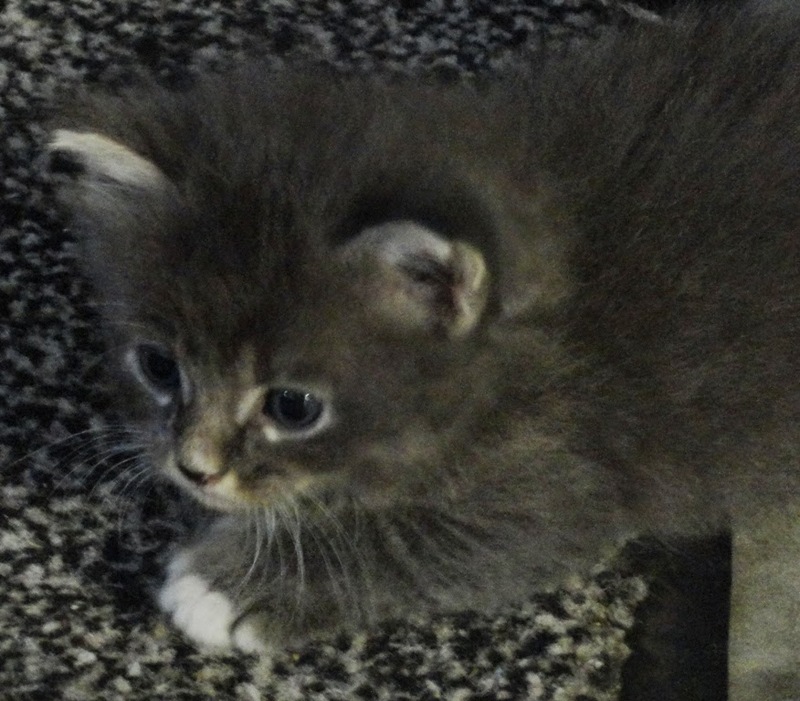 Below is George Clooney, named for his handsome face! 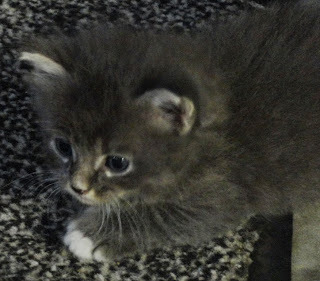 The other gray one is Christopher, who is just as handsome. 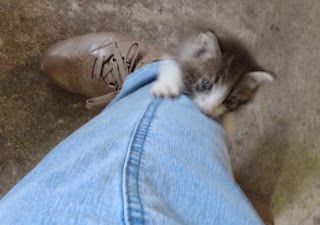 The one with the white face climbing up my leg I first called Crybaby for his constant meowing. Now I interpret his voice as singing and have renamed him Josh Groban. I didn't want him labeled with an unpleasant name. My three inside cats are terrified of the little furballs and will be glad when they are gone, but I will miss them. 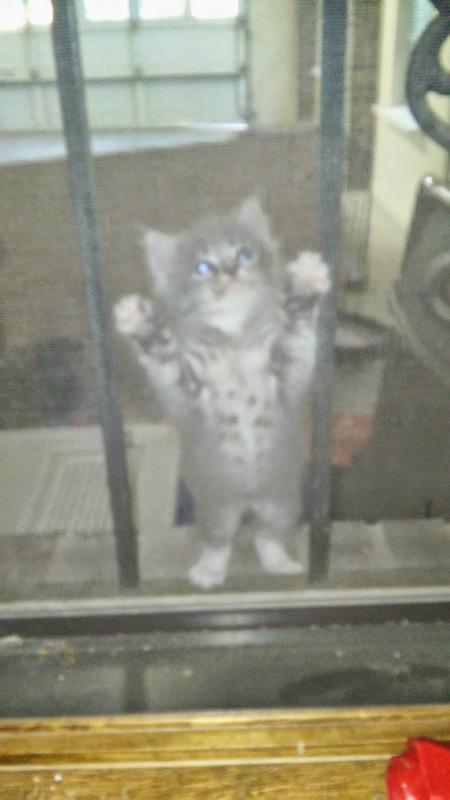 I've been letting the babies explore inside the house, hoping my cats will learn there is no danger from them. No progress on that score.